Lee Dockins speaks at the “Special Olympics at 50” exhibit opening as Tim Shriver looks on. Kentucky World and USA Games gymnast Lee Dockins of Russellville is featured in a new exhibit at the Smithsonian Institution’s National Museum of American History that commemorates the 50th Anniversary of Special Olympics. She is one of four athletes highlighted in the exhibit alongside founder Eunice Kennedy Shriver, a group that includes Special Olympics Chief Inspiration Officer Loretta Claiborne, Special Olympics D.C. athlete Ricardo Thornton and late Special Olympics North Carolina athlete Marty Sheets. The exhibit, which you can see here, features a large photo of Dockins as well as the leotard she wore at the 2007 Special Olympics World Summer Games in Shanghai. At those Games, Dockins won two gold and one silver medal and finished fourth in the all-around. Dockins has competed at three World Games – Shanghai, Athens in 2011 and Los Angeles in 2015 – winning 12 medals, including all-around gold in both 2011 and 2015. She has also competed in three USA Games events – 2006 in Ames, Iowa; 2014 in New Jersey and 2018 in Seattle. She has won 15 USA Games medals, including the all-around gold in 2018. She is one of the most decorated athletes in Special Olympics Kentucky history. 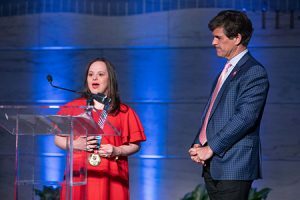 Dockins was invited to attend the exhibit’s opening reception at the United Arab Emirates Embassy in Washington, D.C., where she said, “I feel honored to be here and it makes me happy” before hugging Special Olympics Chair Tim Shriver. The UAE hosted the reception in honor of their hosting of the upcoming 2019 Special Olympics World Summer Games in Abu Dhabi. The exhibit will be open through June 2019.